In this work, we discuss the parametric modeling for the thermodynamic analysis of components of nanoelectronic structures and automatic model order reduction of the consequent parametric models. Given the system matrices at different values of the parameters, we introduce a simple method of extracting system matrices which are independent of the parameters, so that parametric models of a class of linear parametric problems can be constructed. Then the reduced-order models of the large-scale parametric models are automatically obtained using a posteriori output error bounds for the reduced-order models. 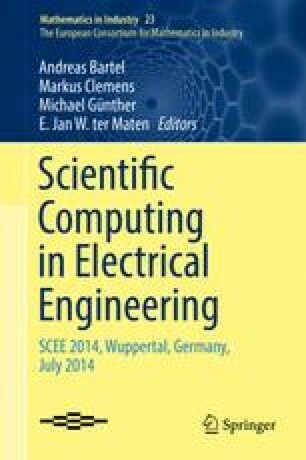 A thermal problem with conductance variations is studied as an example to illustrate the proposed parametric modeling and model order reduction techniques. Feng, L., Antoulas, A.C., Benner, P.: Some a posteriori error bounds for reduced order modelling of (non-)parametrized linear systems MPI Magdeburg Preprint MPIMD/15-17, October 2015. Available from: http://www.mpi-magdeburg.mpg.de/preprints/.